Coconilla seems to have been originated somewhere in the West Indies. It has now widely naturalized to South and South East Asia. 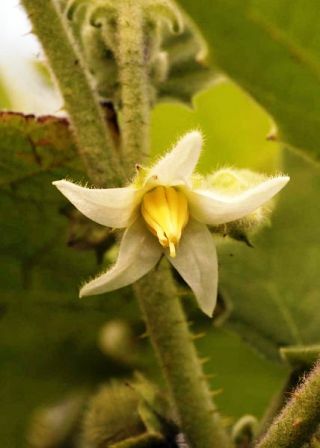 It is grown as a door yard plant in West Indies. A perennial shrub, 120-170 cm or more tall; stem and branches sparsely prickly, stellate tomentose. Leaves 9-13 x 5-10.5 cm, ovate-sinuate, stellately pubescent tomentose. Flowers pale white, in compact paniculate cymes. Peduncles stout, 10-40 mm long. Calyx pubescent. Berry globose, 8-12 mm broad, first green but later yellow. Plant is always loaded with edible, round berry-like fruits which are initially green but turn yellow and finally orange at ripening. These grow in clusters on the plants. 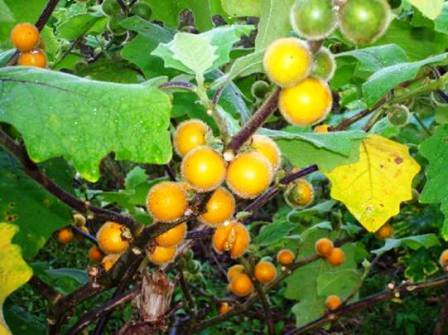 The fruits contain a juicy pulp containing numerous small seeds. The fruits are used for spleenic trouble. In Suriname, the fruits and leaves are used to stimulate the urine discharge. Coconilla is propagated by seed. The seeds are first sown in nursery beds and then planted in the field. This fruit should be planted on sunny locations as it does nor perform well under even under partial shade. 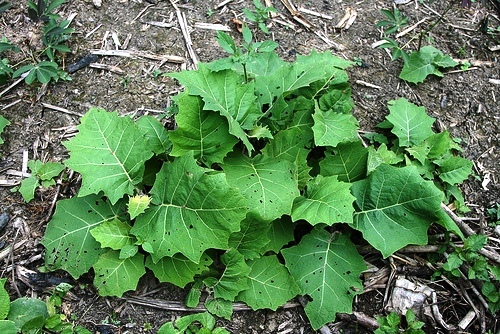 The plant loves moist soils but is very sensitive to frost. I should therefore be planted in frost free locations only. There are two varieties on of which has thorn less leaves and thus relatively easier to handle.